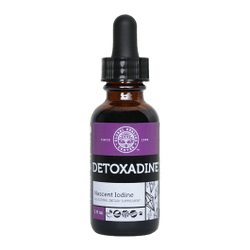 Detoxadine is Global Healing Center's brand of standardized nano-colloidal nascent iodine. It is produced with a transformative bio-elemental matrix and, with a glycerin base, is designed to be more gentle on your digestive system than iodine supplements that contain alcohol. Health Benefits of Nascent Iodine? 180-Day Money Back Guarantee. We'll send you a prompt refund if you aren't absolutely satisfied with the results. A+ Rating 8 Years in a Row. GHC has won the Awards for Excellence from the BBB since 2007.